Onto the night regime for the Kanebo Blanchir series of skincare. I use the Blanchir Whitening Night Conditioner. The picture below shows the Moisture version which is for dry skin and maybe more suitable for those in colder climates where the air is drier. Here in Malaysia, its hot and humid so I go with the normal one (the packaging is the same, just that it doesn’t say “Moisture” on the front). The Whitening Night Conditioner comes in a tub. I don’t usually like creams that come in a tub because of the hygiene factor. Realising this perhaps, Kanebo has included a little spatula with the tub. A flexible plastic ring is included, that you can slip over the top of the tub, with a little slit for the spatula to sit in. Quite ingenious. 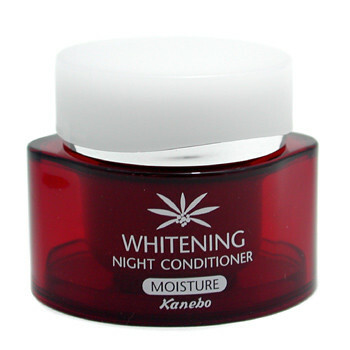 The texture of this night conditioner is similar to that of the milky conditioner, except that its thicker. Its almost a gel texture and has a translucent cream shade. This runnier texture means that you end up using less on your face, thereby stretching your dollar. I found that if I put too much, my face felt a bit sticky. So, I only use a tiny little dollop from the spatula, and its more than sufficient to cover my whole face. What I like about this Night Conditioner is that is makes my face feel so soft after application. It sinks into the skin almost immediately. The next morning when I get up, my face looks dewy and fresh. Its awesome that way! As for the whitening properties, I have stated before that there are less “whitening” than “brightening” properties. I have been using the entire line for a couple of weeks, and I find it works but I can’t vouch for the brightening qualities of each individual product. However, I love this cream simply because it makes my face feel fresh, moisturised, not oily, soft and dewy. You couldn’t ask for more in a night cream. A tub retails for RM168 for 40g. It sounds expensive but it will last, simply because of its light texture. You don’t use a lot of it at all. For me, this is a keeper! Update April 2008: I’m no longer using this as a night cream because I found it too light. I was recommended to layer it over the day moisturiser but I felt it would defeat the purpose. Maybe my skin is getting drier now. I’ve reflected this update in the rating. NEXT POST: Are regular facials necessary? You say you stopped using this cos it was “too light”. what do you mean exactly… did it ligthen your skin TOO much?? Could you please be more specific? @Tee : “too light” here refers to the texture. I found it too light and not moisturising enough. I did not notice much lightening but I am already quite light skinned.